The Examples dialog lists example projects for the selected device or board that are available on the Internet and workstation. The picture shows all available Example projects for the selected board. List of example projects. Narrow the list by applying a filter on the left side of the dialog. Filtering is done by selecting a board or device in the respective panes on the left hand side of the dialog. In addition, you can list only those examples that are installed on your workstation. For this, enable Show examples from installed Packs only. Lists activities that can be executed. Install the Software Pack that contains the example. It may initiate a download of the Software Pack from the Internet. Opens the Copy Example dialog. Opens the Copy Example dialog. Title or brief explanation and purpose of the example. Hover the mouse over the Example field to get brief information about the needed board, device, and Pack version. Use the context menu to cancel all pending actions. Cancel Actions Cancels all pending actions. The amount of pending actions is displayed in the Status Bar (bottom of the window). 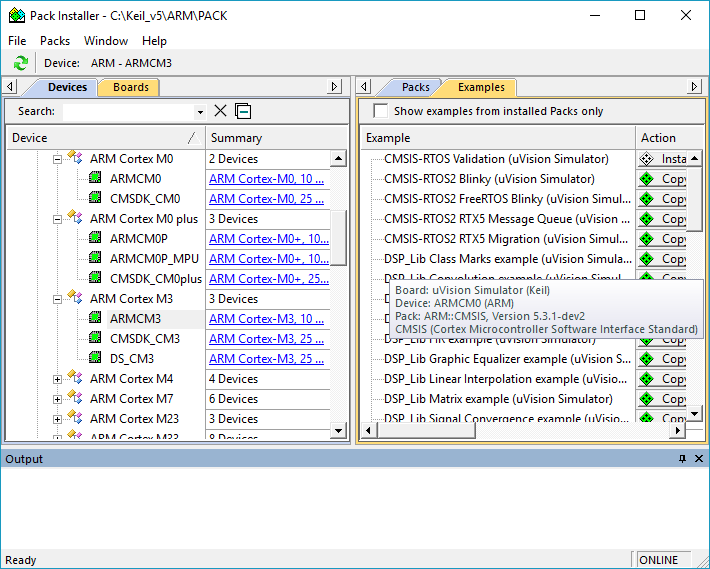 Example projects located in the folder ..\ARM\Pack are read-only, and must be copied to another location. Click the button Copy in the dialog Examples. The dialog Copy Example opens and allows you to set the destination folder. Enter or browse to the path for saving the example. Enable this option to extend the destination folder with the internal path structure of an example. Destination folders are created in case they do not exist. If they exist, they can be overwritten. Warnings are issued, which allows the user to block unwanted actions. Opens the copied example project in a new µVision instance.